Celebrations of the 68th anniversary of victory in the ‘Great Patriotic War’ and the defeat of Nazi Germany have been held across Russia. Thirty eight thousand servicemen and 850 military vehicles joined Victory Parades in 24 Russian cities, the largest of which was held on the Red Square in Moscow. The military show involved over 11,000 servicemen – the march was followed by the demonstration of tanks, anti-ballistic missiles, and other displays of Russian defence systems and weaponry. 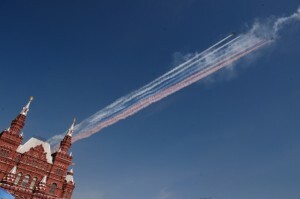 A spectacular air show crowned an hour-long parade with 68 aircrafts flying over the Red Square, with aircrafts dispersing the coulours of the Russian flag in the morning sky. He also said that Russia seeks to preserve peace on the planet, preventing the horrors of war. “We remember what the tragedy of war means, and we will do everything, everything that we can to ensure that no one ever dares unleash another one, to ensure that no one threatens our children, our home, our land. We will do everything to strengthen global security,” President Putin said. Sergei Lavrov, Russia’s foreign minister, had also spoken about the memory of the Great Patriotic War as a “tremendous spiritual power” of the Russian people. “Memory of the Victory will never leave us. It is our duty to ensure that our children and grandchildren preserve the memory of those who fought in the Great Patriotic War,” Lavrov said at the wreath laying ceremony. Over 4,000 Russian cities and towns are holding 8,500 festive events celebrating Victory Day, that are expected to be attended by over 10 million people – from young to old. The capital will see over 1,500 events today, and a fireworks display in the evening. According to the interior ministry, more than 160,000 policemen and about 1,3 000 servicemen are involved in maintaining security during nationwide Victory Day celebrations in Russia. Victory Day parades make up an integral part of the Russian culture, having been held since 1945. The first parade took place on a rainy June 24, 1945, over a month after May 9, the day of Germany’s surrender to Soviet commanders. Today the parade is largely seen as the demonstrations of Russian might, and a commemorative event.